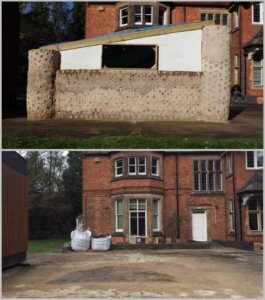 A group of students at the University of Nottingham have created a social enterprise – Bottle by Bottle – that will provide vulnerable communities with safe, affordable housing made from recycled plastic bottles. Operating as part of Enactus, an international not-for-profit organisation that empowers students in entrepreneurial activities to help others and make a better world for all, Bottle by Bottle is guided by Nottingham University Business School. The school supports its students in setting up social enterprises that provide employment as well as social and environmental benefits. 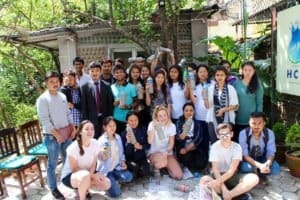 Having successfully built their prototype house made from 1800 plastic bottles filled with sand, tied together with string and secured with mortar and wire, Bottle by Bottle proved that their unique technique works and were ready to put this into practice by building the real thing in a Nepali village stricken by 2015’s earthquake. Bottle by Bottle visited the village at Easter and met a woman who couldn’t receive government grants to build a conventional home and currently lives in a temporary tin sheet shack with her daughter and four-month old granddaughter. The team will fly out again on 4 September and, working alongside Architects Sans Frontières Nepal, will build this family a new house. When Bottle by Bottle approached us for any professional advice and support we could offer we were more than happy to help as the work they’re doing is key to building a sustainable future and will directly improve local communities – something the Lungfish team is passionate about. Although one-off buildings made of plastic bottles have been done previously, we were fascinated to learn that never before have students built a structure the size of their prototype entirely out of plastic bottles, nor has this kind of project been developed into a long-term enterprise. This innovative method not only costs less than half the price of conventional Nepali brick houses, it will also drastically reduce the negative impacts of plastic waste in an area where plastic bottles are simply thrown onto the street or burnt. The Bottle by Bottle team is also striving towards developing a construction technique that it earthquake resistant. We offered to support the Bottle by Bottle team by providing them with professional guidance and casting an expert eye over the drawings they produced. Looking at their designs in line with Nepal’s national building codes, we made several recommendations. From their contacting the relevant local authorities directly to ascertain what level of structural detail would be sufficient, to the possibility of their constructing a bamboo frame to minimise the reliance on the bottle walls supporting the roof. We reviewed the suggested building techniques and provided some guidance relating to the effects of water ingress and temperature changes affecting the structure of the building. Fundamentally, we recommended they have a structural engineer look at their design and offer any structural advice. We were really impressed with the dedication and innovation demonstrated by the Bottle by Bottle team for such a worthwhile project which will help many earthquake-affected communities and prove invaluable to those families. For now, Bottle by Bottle has three main aims: to create safe and affordable structures in the developing world, incorporate waste management and create jobs for the local community where employment is sparse. Getting the local community involved is key to the success and sustainability of the enterprise – by empowering people with the skills to build their own affordable housing, lives will be changed for generations to come. And that’s an outcome the Lungfish team feels privileged to have been part of. We wish them every success as they embark on their journey of making a better life for families, one bottle house at a time. To learn more about the upcoming trip to Nepal and to help a community in need, please visit the Bottle by Bottle JustGiving page.